Herbivores have developed mechanisms to overcome adverse effects of dietary tannins through the presence of tannin-resistant bacteria. Tannin degradation is an unusual characteristic among bacteria. Streptococcus gallolyticus is a common tannin-degrader inhabitant of the gut of herbivores where plant tannins are abundant. The biochemical pathway for tannin degradation followed by S. gallolyticus implies the action of tannase and gallate decarboxylase enzymes to produce pyrogallol, as final product. From these proteins, only a tannase (TanBSg) has been characterized so far, remaining still unknown relevant proteins involved in the degradation of tannins. In addition to TanBSg, genome analysis of S. gallolyticus subsp. gallolyticus strains revealed the presence of an additional protein similar to tannases, TanASg (GALLO_0933). Interestingly, this analysis also indicated that only S. gallolyticus strains belonging to the subspecies “gallolyticus” possessed tannase copies. This observation was confirmed by PCR on representative strains from different subspecies. In S. gallolyticus subsp. gallolyticus the genes encoding gallate decarboxylase are clustered together and close to TanBSg, however, TanASg is not located in the vicinity of other genes involved in tannin metabolism. The expression of the genes enconding gallate decarboxylase and the two tannases was induced upon methyl gallate exposure. As TanBSg has been previously characterized, in this work the tannase activity of TanASg was demonstrated in presence of phenolic acid esters. TanASg showed optimum activity at pH 6.0 and 37°C. As compared to the tannin-degrader Lactobacillus plantarum strains, S. gallolyticus presented several advantages for tannin degradation. Most of the L. plantarum strains possessed only one tannase enzyme (TanBLp), whereas all the S. gallolytcius subsp. gallolyticus strains analyzed possesses both TanASg and TanBSg proteins. More interestingly, upon methyl gallate induction, only the tanB Lp gene was induced from the L. plantarum tannases; in contrast, both tannase genes were highly induced in S. gallolyticus. Finally, both S. gallolyticus tannase proteins presented higher activity than their L. plantarum counterparts. The specific features showed by S. gallolyticus subsp. gallolyticus in relation to tannin degradation indicated that strains from this subspecies could be considered so far the best bacterial cellular factories for tannin degradation. Tannins are widespread in the plant kingdom, and are often found in woody, lignified tissues . Tannins form weak, pH-dependent and reversible associations with a range of substrates such as cellulose, proteins or enzymes, among others, often making the substrate resistant to microbial attack . Several reports have suggested that the presence of tannins at less than 6% dry matter of the herbivore diet may result in improved animal performance. In contrast, detrimental effects of condensed tannins in excess of 6% dry matter include decreased growth rate and body weight gain, perturbation of mineral absorption, and inhibition of digestive enzymes . Therefore, some herbivores have developed mechanisms to overcome adverse effects of tannins, at least partly, through the presence of tannin-resistant microorganisms . Streptococcus gallolyticus (formerly known as Streptococcus bovis biotype I) has been isolated as a tannin-resistant bacterium from diverse habitats. It is a normal inhabitant of the rumen and has been isolated from feces of koalas, kangaroos, Japanese large wood mouse, cows, horses, pigs, and guinea pigs -. The presence of S. gallolyticus strains in the digestive tract of herbivores may play an essential role for the host in order to assimilate the tannin-rich diets from their natural habitats. The specific catabolic capacities of S. gallolyticus likely provide this bacterium a selective advantage to survive in the gut of herbivores, where tannins of plant origin are abundant. Therefore, a symbiotic relationship could exist between the animal host and the bacteria to counteract the antinutritional effect of dietary tannins . S. gallolyticus strains hydrolyzed tannic acid to release gallic acid, which was subsequently decarboxylated to pyrogallol . The proposed biochemical pathway for the degradation of tannins by S. gallolyticus implies the action of a tannase and a gallate decarboxylase enzyme to decarboxylate the gallic acid formed by tannase action . Pyrogallol is formed as a final product from tannin biodegradation . An identical pathway is also used by Lactobacillus plantarum strains to degrade tannins. 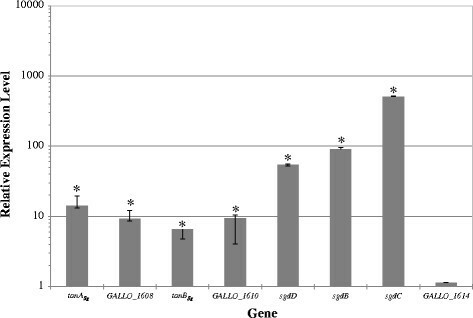 The L. plantarum genes encoding tannase (tanB Lp , formerly called tanLp1)  and gallate decarboxylase (lpdBCD)  involved in tannin degradation have been identified. In addition, a second tannase gene (tanA Lp ) present in some L. plantarum strains has been recently described . Upon tannin induction, the expression of tanB Lp was induced, whereas tanA Lp expression was not affected . Moreover, TanALp has a specific activity ten times lower than the specific activity calculated for TanBLp tannase. Similarly to L. plantarum, the genome of S. gallolyticus UCN34 revealed unique features among streptococci related to its adaptation to the rumen environment such as its ability to degrade tannins . Tannins must be degraded by the action of a tannase enzyme . A gene encoding a nonsecreted protein similar to TanBLp (GALLO_1609) was found in the S. gallolyticus UCN34 genome. This protein TanBSg (formerly called TanSg1) has been biochemically characterized recently . In addition, another gene, GALLO_1609, encoding a 596-amino acid long protein 43% identical to the tannase from Staphylococcus lugdunensis (TanASl)  is present in the S. gallolyticus UCN34 genome. From the genes involved in tannin degradation in S. gallolyticus, only the tanB Sg gene encoding a tannase has been identified so far , remaining unknown the genes encoding the gallate decarboxylase enzyme as well as a putative second tannase enzyme. In this work, S. gallolyticus tannase and gallate decarboxylase encoding genes involved in tannin degradation have been identified and their expression comparatively studied. In addition a novel tannase has been characterized. These results provide new relevant insights into S. gallolyticus tannin degradation, a rare biochemical property among bacteria. The formerly Streptococcus bovis group is a large bacterial complex including different species frequently isolated from animals. In 2003, the physiological differentiation between species related to the complex and the clarification of their respective phylogenetic position was improved . The updated classification included three subspecies: S. gallolyticus subsps. gallolyticus, S. gallolyticus subsp. pasteurianus, and S. gallolyticus subsp. macedonicus. These can be identified according to differential biochemical reactions. Among these biochemical tests, tannase activity was only described in S. gallolyticus subsp. gallolyticus strains. Only strains from this subspecies hydrolyze methyl gallate (tannase activity) and decarboxylate gallic acid to pyrogallol  (Figure 1). Schematic representation of tannin degradation pathway followed by S. gallolyticus . When R1 is (H) the represented compounds are a protocatechuate ester, protocatechuic acid, and catechol. When R1 is (OH) the represented compounds are a gallate ester, gallic acid, and pyrogallol. R2 could be (OCH3) representing methyl ester of gallic/protocatechuic acid, (OCH2CH3) representing ethyl esters, (OCH2CH2CH3) propyl esters, (glucose) as in tannic acid, or (epigallocatechin) in epigallocatechin gallate. TanASg and TanBSg represented tannase enzymes and SgdB, SgdC, and SgdD, represent the three subunits of gallate decarboxylase enzyme. The ability to degrade tannins is a specific attribute of S. gallolyticus subsp. gallolyticus deemed important in hostile environments, as tannins are toxic polyphenolic compounds that form strong complexes with proteins and other macromolecules. The S. gallolyticus subsp. gallolyticus UCN34 genome revealed the presence of two proteins similar to tannases, TanASg (GALLO_0933) and TanBSb (GALLO_1609). The tannase proteins from S. lugdunensis (TanASl), L. plantarum (TanALp and TanBLp) and S. gallolyticus (TanASg and TanBSg) were aligned. The alignment revealed that two protein groups could be easily identified. TanA proteins, higher than 60 kDa and possessing a cleavage site of a peptide signal, and TanB proteins, having around 50 kDa of molecular size. The identity degree among TanA and TanB proteins is lower than 30%. The comparison of the amino acid sequence of these tannase proteins with TanBLp, whose tridimensional structure have been recently solved , revealed that the residues important for activity are conserved. All the analyzed proteins possessed the conserved motif Gly-X-Ser-X-Gly typical of serine hydrolases. The catalytic triad identified in the TanBLp structure (Ser-163, Asp-419, and His-451) is only conserved in the TanB proteins. In both TanA proteins Asp-419 is substituted by a Gln residue. This amino acid variation was noticed previously and suggested that the conserved residue Asp-421 may fulfil the role of Asp-419 as the acidic residue of the catalytic triad . The residues identified that make contacts with the three hydroxyl groups of gallic acid (Asp-421, Lys-343, and Glu-357, in TanBLp) are conserved in all the tannase proteins analyzed (Additional file 1: Figure S1A). When TanA proteins were compared identity degrees ranging from 44-50% were found (Additional file 1: Figure S1B). However, the identity among TanB proteins was more lower (32%) (Additional file 1: Figure S1C). As described previously for S. gallolyticus spp., only strains from the subspecies gallolyticus possess tannase activity . However, it is not known if both tannase proteins are present in all the S. gallolyticus subsp. gallolyticus strains. Currently, the genomes of four S. gallolyticus subsp. gallolyticus strains are available (UCN34, ATCC 43143, ATCC BAA-2069, and TX2005 strains). A genome search revealed that the four strains possessed both tannase genes, TanASg (GALLO_0933, SGGB_0917, SGGBAA2069_c09070/80, and HMPREF9352_1611) or TanBSg (GALLO_1609, SGGB_1624, SGGBAA2069_c16370, and HMPREF9352_0937) in UCN34, ATCC 43143, ATCC BAA-2069, and TX2005 strains, respectively. In relation to TanASg from UCN34 strain, the proteins from TX2005 and ATCC 43143 strains exhibited 3 or 5 amino acid changes (data not shown). In addition, the TanASg protein from ATCC BAA-2069 posses a mutation at position Tyr-230 which originates a stop codon, and therefore, a truncated protein (data not shown). In relation to TanBSg proteins, protein from UCN34, ATCC 43143, and ATCC BBA-2069 strains were identical, however, protein from TX2005 strain showed 20 amino acid substitutions (data not shown). These results seem to indicate that all the strains from the S. gallolyticus subsp. gallolyticus possessed both, tanA Sg and tanB Sg genes. In order to associate the presence of these genes with the “gallolyticus” subspecies, DNA from different S. gallolyticus subspecies was used to amplify tanA Sg and tanB Sg genes. Oligonucleotides 803-804, and 774-775 amplified 1.7 and 1.4 kb DNA fragments from tanA Sg and tanB Sg , respectively. From the strains assayed, only S. gallolyticus DSM 13808, S. gallolyticus subsp. gallolyticus UCN34, and S. gallolyticus subsp. gallolyticus DSM 16831T strains produce the two amplicons (Figure 2). No amplification was observed in strains belonging to the other S. gallolyticus subspecies, e.g. S. gallolyticus subsp. pasteurianus DSM 15351T, and S. gallolyticus subsp. macedonius DSM 15879T. These results indicated that, similarly to tannase activity, the presence of tanA Sg and tanB Sg genes seems to be specific for the subspecies gallolyticus. PCR amplification of tannase encoding genes from several S. gallolyticus strains. 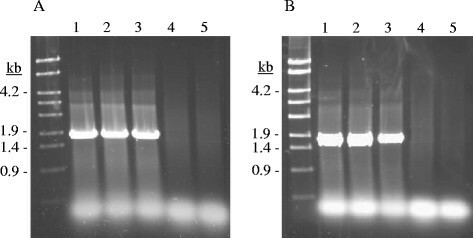 (A) Amplification of 1.7-kb DNA fragment of tanA Sg with oligonucleotides 803-804. (B) Amplification of 1.4-kb tanB Sg fragment with oligonucleotides 774-775. Chromosomal DNA from the following S. gallolyticus strains was used for PCR amplification: S. gallolyticus DSM 13808 (1), S. gallolyticus subsp. gallolyticus DSM 16831T (2), S. gallolyticus subsp. gallolyticus UCN34 (3), S. gallolyticus subsp. pasteurianus DSM 15351T (4), and S. gallolyticus subsp. macedonius DSM 15879T (5). PCR fragments were subject to agarose gel electrophoresis and stained with Gel Red. Left lane, λ-EcoT14I digest (Takara). Numbers indicated some of the molecular sizes (in kb). The presence of both tannase genes in all the S. gallolyticus subsp. gallolyticus strains analyzed is in contrast with the uncommon presence of tanA Lp among L. plantarum strains. Only 4 strains out of 29 L. plantarum strains analyzed possessed both tannase genes. Another significant difference among L. plantarum and S. gallolyticus strains is the organization of the genes involved in tannin degradation. In L. plantarum the genes encoding gallate decarboxylase (lpdC, and lpdBD) are separated in the chromosome by more than 1 Mb ; however in S. gallolyticus, the genes encoding gallate decarboxylase are clustered together (sgdCBD or GALLO_1613, GALLO_1612, and GALLO_1611, respectively) (Figure 3). Regarding the region involved in tannin degradation, all the currently available S. gallolyticus genomes displayed the same genetic organization as the S. gallolyticus UCN34 strain (Figure 3). In S. gallolyticus strains, TanASg and TanBSg are separated from 691 (TX2005 strain) to 750 kb (ATCC BAA-2069 strain). Similarly to L. plantarum, TanB is located close to subunit C, the catalytic subunit of the gallate decarboxylase. However, TanA is not located in the vicinity of other genes involved in the metabolism of tannins in L. plantarum and S. gallolyticus. The different chromosomal location of both tannase genes could indicate a different function and regulation. Genetic organization of the S. gallolyticus subsp. gallolyticus UCN34 chromosomal region containing gallate decarboxylase and tannase encoding genes (accession NC_013798, positions 1708280/c-1698323/c and 984535/c-981288/c). The genetic organization of the chromosomal region containing the same genes in L. plantarum WCFS1 (NC_004567) or ATCC 14917T (ACGZ02000013.1) is also represented. Arrows indicate genes. Genes coding for TanA tannase proteins are coloured in blue and TanB in pink. Genes encoding gallate decarboxylase subunits are coloured in yellow and each different subunit is represented by different drawing. In order to know the specific physiological role of both S. gallolyticus tannases the study of their synthesis under the presence of a substrate could provide relevant data. As tannase and gallate decarboxylase are involved in tannin degradation, the relative expression of their encoding-genes under methyl gallate exposure was studied. S. gallolyticus UCN34 cultures were induced for 10 min by the presence of 15 mM methyl gallate as potential tannase substrate. Figure 4 shows the relative expression levels of tanA Sg , tanB Sg , and sgdCBD genes under methyl gallate exposure. The highest induction was observed in the genes encoding gallate decarboxylase, sgdC, sgdB and sgdD which increased their expression 507, 90 and 54 times, respectively. Similarly, tanA Sg and tanB Sg genes were induced 14- and 6-fold, respectively. This result is in contrast with the expression pattern observed on the equivalent tannase proteins from L. plantarum since the presence of 15 mM methyl gallate slightly induces (about 3-fold) the expression of tanB Lp gene. The expression behaviour observed in S. gallolyticus UCN34 allow us to assume that, in the presence of substrate, all the genes involved in tannin degradation were highly induced. Comparison of the relative expression levels of tannase and gallate decarboxylase genes in response to methyl gallate exposure. Relative expression levels in 15 mM methyl gallate were calculated with the 7500 Fast System relative quantification software using S. gallolyticus 16S rRNA gene as endogenous gene and the growth in the absence of methyl gallate as growth condition calibrator. The experiments were done in triplicate. The mean value and the standard error are shown. Asteriks indicate a p value <0.1. When TanBLp was the only tannase described from L. plantarum, homology searched allowed us to identify tanB Sg (GALLO_1609). The gene was cloned and expressed in E. coli, and the recombinant TanBSg protein was biochemically characterized . The data indicated that, as compared to TanBLp, TanBSg possesses remarkable biochemical properties. TanBSg has a specific activity 41% higher than TanBLp, and displays optimum activity at pH 6-8 and 50-70°C, showing high stability over a broad range of temperatures . However, in relation to its substrate range and contrarily to TanBLp, only esters with a short aliphatic alcohol were effectively hydrolyzed by TanBSg. Taking into account only the activity of TanB tannases, it seems that S. gallolyticus could hydrolyze tannins more efficiently than L. plantarum strains. Recently it has been described that in a few L. plantarum strains, a second tannase gene (tanA Lp) could be found . Compared to TanBLp, the TanALp protein presented ten times lower specific activity, and showed differences in optimal pH and temperature. In order to demonstrate the functionality of TanASg protein, and to know its biochemical properties and relevance on tannin degradation, the tanA Sg gene was expressed in E. coli under the control of an IPTG inducible promoter. Cell extracts were used to detect the presence of overproduced proteins by SDS-PAGE analysis. Whereas control cells containing the pURI3-TEV vector did not show protein overexpression, an overproduced protein with a molecular mass around 63 kDa was apparent with cells harbouring pURI3-TEV-TanASg (Figure 5). Since the cloning strategy yields a His-tagged protein variant, S. gallolyticus pURI3-TEV-TanASg could be purified on an immobilized metal affinity chromatography (IMAC) resin. The recombinant protein was eluted from the resin at 150 mM imidazole, and observed as single band on 10% SDS-PAGE (Figure 5). SDS-PAGE analysis of the expression and purification of S. gallolyticus TanA Sg protein. Analysis of soluble cell extracts of IPTG-induced E. coli BL21(DE3) (pURI3-TEV) (1) or E. coli BL21(DE3) (pURI3-TEV-TanASg) (2), flowtrough (3), or fractions eluted after His affinity resin (4-8). The arrow indicated the overproduced and purified protein. The gel was stained with Coomassie blue. Molecular mass markers are located at the left (SDS-PAGE Standards, Bio-Rad). To demonstrate tannase activity, the TanASg protein purified by affinity chromatography was incubated in the presence of different esters of gallic acid. As expected for a tannase enzyme, TanASg was able to hydolyze esters from gallic acid, confirming their tannase activity (Figure 6-1). TanASg hydrolyzes methyl, ethyl and propyl gallate, but similarly to TanBSg and TanALp, was unable to hydrolyze esters having an alcohol substituent as long as lauryl, which was hydrolyzed by TanBLp. As a general rule of the bacterial tannases described so far, a protocatechuate ester (ethyl protocatechuate) was also hydrolyzed by TanASg. Esters from other phenolic acids assayed were not hydrolyzed (data not shown). These results confirmed that TanASg is a functional tannase with a substrate range resembling the bacterial tannases described previously ,,. Tannase activity of S. gallolyticus TanA Sg protein against simple phenolic esters (1) and complex tannins (2). Hydrolase activity of purified TanASg protein was analyzed on triplicate and compared with control reactions on which the enzyme was omitted. 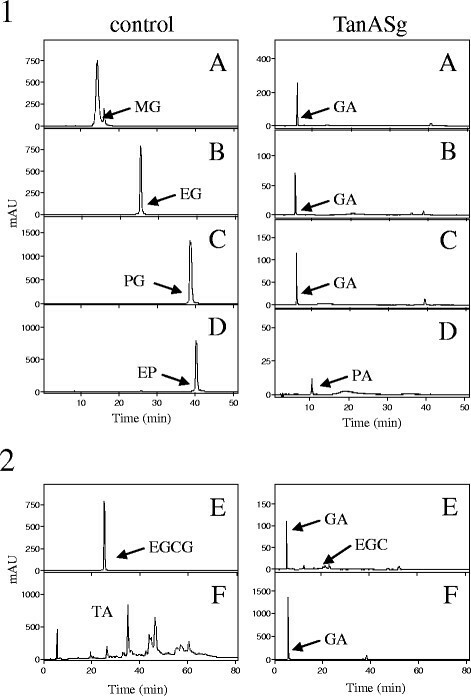 HPLC chromatograms of TanASg (100 μg) incubated in 1 mM of methyl gallate (A), ethyl gallate (B), propyl gallate (C), ethyl protocatechuate (D), epigallocatechin gallate (E), and tannic acid (F). The methyl gallate (MG), ethyl gallate (EG), propyl gallate (PG), ethyl protocatechuate (EP), epigallocatechin gallate (EGCG), tannic acid (TA), gallic acid (GA), protocatechuic acid (PA), and epigallocatechin (EGC) detected are indicated. The chromatograms were recorded at 280 nm. Different dietary plant varieties produce different types and quantities of phenolic compounds . As the digestive tract of herbivores probably contains different tannins, we focused our studies on the relatively well-define commercially available preparations, tannic acid and epigallocatechin gallate. Tannic acid is almost exclusively formed by poly-galloyl glucose, and gallic acid was observed as the final product of TanASg activity on tannic acid (Figure 6-2). Similarly, gallic acid was released from epigallocatechin as a result of the action of TanASg on epigallocatechin gallate. These results confirmed the capacity of TanASg to degrade dietary tannins. Once the tannase activity of TanASg was confirmed, their biochemical properties were determined. Since tannase catalyzes the hydrolysis of the galloyl ester linkage releasing gallic acid, the activity of tannase could be measured by estimating the gallic acid formed by the enzyme action . A rhodanine specific method for the detection of gallic acid was used for a reliable quantification of tannase activity . Rhodanine reacts with the vicinal hydroxyl groups of gallic acid to give a red complex with a maximum absorbance at 520 nm. Rhodanine assay was used to determine the specific activity of TanASg. Using methyl gallate as substrate, the specific activity of TanASg was 256 U/mg, 55% or 37% lower than the specific activity of TanBSg (577 U/mg) or TanBLp (408 U/mg); however, it was more than 6 times higher than the activity of the equivalent protein from L. plantarum, TanALp (39 U/mg). These activity data indicated that S. gallolyticus strains have more potential to degrade tannins than L. plantarum strains. These activity data indicated that S. gallolyticus strains have more potential to degrade tannins than L. plantarum strains. Firstly, in L. plantarum only a small number of strains possessed tanA Lp gene, an inducible gene, whereas all the S. gallolytius subsp. gallolyticus strains analyzed so far possesses both tannase genes, being the two genes inducible by gallate esters. More importantly, tannases from S. gallolyticus possess higher specific activity than their counterparts from L. plantarum. A roughly estimation shows that S. gallolyticus strains bearing TanASg and TanBSg posses a two-fold higher tannase activity than most L. plantarum strains possessing only TanBLp tannase. In order to known if TanASg possesses additional valuable biochemical features, its optimal pH and temperature was analyzed. The biochemical characterization of TanASg revealed an optimal pH around 6, being also highly active at pH 6-8 (Figure 7A). This optimal pH is slightly lower than that reported for TanBLp (optimal pH 7.0-8.0) ,, but similar than that of TanBSg and TanALp. The optimum temperature for activity is 37°C, however the enzyme also exhibited very high activity at higher temperatures (Figure 7B). At 65°C TanASg showed more than 80% of the maximum activity. TanASg is able to hydrolyze the substrate (methyl gallate) at high temperatures. In addition, TanASg showed an improved thermal stability compared to TanBLp, since it retained more than 70% of the maximal activity after 18 h incubation at 37°C (Figure 7C). Non-ionic detergents showed different effect on TanASg activity. Whereas Triton-X-100 did not affect activity, Tween-80 greatly increased tannase activity (Figure 7D). Similarly to TanBLp, among metal ions, Ca2+ and K+ increased and Hg2+ greatly inhibited TanASg activity . The ions Zn2+ and Mg2+ partially inhibited the enzyme. The activity of TanASg was also significantly inhibited by β-mercaptoethanol (Additional file 2: Table S1). Some biochemical properties of TanA Sg protein. (A) Relative activity versus pH. (B) Relative activity of TanASg versus temperature. (C) Thermal stability of TanASg after preincubation at 22°C (filled diamond), 30°C (filled square), 37°C (filled triangle), 45°C (cross), 55°C (star), and 65°C (filled circle) in phosphate buffer (50 mM, pH 6.5); at indicated times, aliquots were withdrawn, and analyzed as described in the Methods section. The observed maximum activity was defined as 100%. (D) Relative activity of TanASg after incubation with 1 mM concentrations of different additives. The activity of the enzyme in the absence of additives was defined as 100%. The experiments were done in triplicate. The mean value and the standard error are shown. Asteriks indicate a p value <0.05. 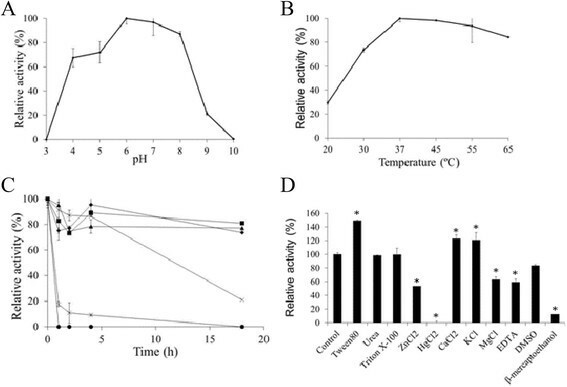 In addition to TanBSg activity, the biochemical properties showed by TanASg such as high specific activity, optimal temperature (37°C) and broad pH range indicated that S. gallolyticus subsp. gallolyticus strains are so far the bacterial cells better adapted to degrade the tannins present on the diet. It has been described that S. gallolyticus initially responds to tannins with an increased lag phase and decreased growth rate . The response mechanisms used by S. gallolyticus strains enables them to maintain growth and biosynthetic capacity in the presence of high tannin concentrations . In summary, this study confirmed among bacteria the specific characteristics present in S. gallolyticus subsp. gallolyticus strains which could be important for survival in the gut environment of herbivores, where a large diversity of tannins is present. S. gallolyticus subsp. gallolyticus should be able to degrade these polyphenols and it is known that this bacterium does not depend on other microorganisms for their degradation. The tannin degradation pathway followed by S. gallolyticus subsp. gallolyticus strains implies the combined action of tannase and gallate decarboxylase, which are close on S. gallolyticus genome and seems to act coordinately. In addition, the presence in all the S. gallolyticus subsp. gallolyticus strains of a second, inducible and extracellular tannase enzyme provide them additional advantages for the degradation of high-molecular tannins. The specific features showed by S. gallolyticus subsp. gallolyticus in relation to tannin degradation suggested that these strains are the best bacterial factories for tannin degradation described so far. This explains the widespread occurrence of S. gallolyticus in the rumen of livestock that frequently browse tannin-containing forages, and it is likely that the presence of S. gallolyticus provides a selective advantage to these animals. S. gallolyticus subsp. gallolyticus UCN34 (CIP 110142) used through this study was kindly provided by Dr. Philippe Glaser (Institut Pasteur, France). S. gallolyticus DSM 13808, S. gallolyticus subsp. gallolyticus DSM 16831T, S. gallolyticus subsp. pasteurianus DSM 15351T, and S. gallolyticus subsp. macedonius DSM 15879T were purchased from the German Collection of Microorganisms and Cell Cultures (DSMZ). Escherichia coli DH10B and E. coli BL21 (DE3) were used as transformation and expression hosts in the pURI3-TEV vector . The S. gallolyticus strains were grown in BHI medium at 37°C without shaking, and the E. coli strains were cultured in Luria-Bertani (LB) medium at 37°C and shaking at 200 rpm. Genes encoding S. gallolyticus tannases (tanA Sg and tanB Sg ) were amplified by PCR using chromosomal DNA from S. gallolyticus strains. The tanA Sg gene (1.7 kb) was amplified by using primers 803 and 804 (Additional file 3: Table S2). Oligonucleotides 774 and 775 were used to amplify tanB Sg gene (1.4 kb). The reactions were performed in a Personal thermocycler (Eppendorf), using 30°Cycles of denaturation at 94°C for 30 s, annealing at 55°C for 1 min, and extension at 72°C for 2 min. Amplified fragments were resolved in agarose gels. For RNA isolation, BHI cultures of S. gallolyticus subsp. gallolyticus UCN34 were grown up to an OD 600nm of 1 and then supplemented with methyl gallate at 15 mM final concentration. As control, RNA was also isolated from cultures not supplemented with methyl gallate. The induced cells and their corresponding controls were centrifuged at 4°C after 10 min of exposure to the gallate ester. The pellet was mixed with 2 mL of quenching buffer (60% methanol, 66.7 mM HEPES, pH 6.5, -40°C). Following quenching, the cells were centrifuged at 9,000 × g for 10 min at -10°C and suspended in an extraction mixture (500 μL 1:4 chloroform-acid phenol, 30 μL of 10% SDS, 30 μL Na-acetate 3 M pH 5.2, 400 μL Tris-EDTA buffer [10 mM Tris(hydroxymethyl)amino methane, 1 mM EDTA] pH 7.4, 15 Mg of polyvinylpoly-pyrrolidone, and 500 Mg of glass beads (ϕ, 75-150 μm). The cells were broken under frozen conditions in a Mini-Bead Beater (Biospec Products, INC.) using three treatments of 4600 rpm for 40 seconds and chilled 1 min between cycles. The suspension was then centrifuged at 4°C at 10,000 × g for 2 min. After two extractions with 500 μL of chloroform the supernatant containing the RNA was immediately frozen in liquid nitrogen, and stored at -80°C. NanoDrop ND1000 instrument was used for quantification of RNA. The A260/A280 and A260/A230 ratios were measured to check RNA purity. Integrity and quality of RNA samples were determined by electrophoresis on agarose gels. Two treatments with DNase I (Ambion) were applied and the absence of genomic DNA was confirmed by PCR . The DNA-free RNA was reverse transcribed using the High Capacity cDNA Reverse Transcription Kit (Applied Biosyntems) according to the manufacturer instructions. From the cDNA obtained, quantitative gene expression was analyzed in an AbiPrism 7500 Fast Real Time PCR system (Applied Biosystems). The SYBR Green method was used and each assay was performed in triplicate using SYBR Green real-time PCR Master Mix (Applied Biosystems). Amplification was initiated at 95°C for 10 min, followed by 40°Cycles of 95°C for 15 s and 60°C for 1 min. Control PCRs were included to confirm the absence of primer dimer formation (no-template control), and to verify that there was no DNA contamination (without RT enzyme negative control). Specific primer pairs were designed with the Primer Express 3.0 program to amplify internal regions of tannase and gallate decarboxylase encoding genes (Additional file 3: Table S2). All qPCR assays amplified a single product as determined by melting curve analysis and by electrophoresis. A standard curve was plotted with cycle threshold (Ct) values obtained from amplification of known quantities of cDNA and used to determine the efficiency (E) as E = 10-1/slope. In order to measure S. gallolyticus gene expression, amplification of the endogenous control gene was performed simultaneously and its relative expression compared with that of the target gene. Results were analyzed using the comparative Ct method (also named double delta-delta Ct, 2ΔΔCt method). Genes were considered differentially expressed when a nominal p-values were <0.1 and had a fold change (FC) ≥2. Relative expression levels were calculated with the 7500 Fast System relative quantification software using S. gallolyticus 16S rRNA gene as endogenous gene and the growth in the absence of methyl gallate as growth condition calibrator. The gene encoding a putative tannase (GALLO_0933, or tanA Sg ) in S. gallolyticus UCN34 (accession YP_003430356) was PCR-amplified by PrimeSTAR HS DNA polymerase (Takara). As a peptide signal was predicted in the TanASg sequence, primers 803 and 804 were used to amplify and clone TanASg lacking the 26-amino acid peptide signal sequence. The gene was cloned into the pURI3-TEV vector which encodes expression of a leader sequence containing a six-histidine affinity tag. The purified 1.7-kb PCR product was then inserted into the vector by using a restriction enzyme- and ligation-free cloning strategy . E. coli DH10B cells were transformed, recombinant plasmids were isolated, and those containing the correct insert were identified by restriction enzyme analysis, verified by DNA sequencing, and then transformed into E. coli BL21 (DE3) cells for expression. E. coli BL21 (DE3) cells carrying the recombinant plasmid, pURI3-TEV-TanASg, were grown at 37°C in LB media containing ampicillin (100 μg/ml) on a rotary shaker (200 rpm) until an optical density at 600 nm of 0.4 was reached. Isopropyl-β-D-thiogalactoside (IPTG) was added to a final concentration of 0.4 mM and protein induction was continued at 22°C for 18 h.
The induced cells were harvested by centrifugation (8,000 g, 15 min, 4°C), resuspended in phosphate buffer (50 mM, pH 6.5) and disrupted by French Press passages (three times at 1,100 psi). The insoluble fraction of the lysate was removed by centrifugation at 47,000 g for 30 min at 4°C. The supernatant was filtered through a 0.2 μm pore-size filter and then applied to a Talon Superflow resin (Clontech) equilibrated in phosphate buffer (50 mM, pH 6.5) containing 3 mM NaCl and 10 mM imidazole to improve the interaction specificity in the affinity chromatography step. The bound enzyme was eluted using 150 mM imidazole in the same buffer. The purity of the enzymes was determined by SDS-PAGE in Tris-glycine buffer. Fractions containing the His6-tagged protein were pooled and analyzed for tannase activity. Tannase activity was determined using a rhodanine assay specific for gallic acid . Rhodanine reacts only with gallic acid and not with galloyl esters or other phenolics. Gallic acid analysis in the reactions was determined using the following assay. Tannase enzyme (100 μg) in 700 μL of 50 mM phosphate buffer pH 6.5 was incubated with 40 μL of 25 mM methyl gallate (1 mM final concentration) for 5 min at 37°C. After this incubation, 150 μL of a methanolic rhodanine solution (0.667% w/v rhodanine in 100% methanol) were added to the mixture. After 5 min incubation at 30°C, 100 μL of 500 mM KOH was added. After an additional incubation of 5-10 min, the absorbance at 520 nm was measured on a spectrophotometer. A standard curve using gallic acid concentration ranging from 0.125 to 1 mM was prepared. One unit of tannase activity was defined as the amount of enzyme required to release 1 μmol of gallic acid per minute under standard reaction conditions. The pH profile of TanASg activity was determined using different 100 mM buffer systems containing acetic acid-sodium acetate (pH 3.0-5.0), citric acid-sodium citrate (pH 6), sodium phosphate (pH 7), Tris-HCl (pH 8), glycine-NaOH (pH 9), and sodium carbonate-bicarbonate (pH 10). The rhodanine assay was used for the optimal pH characterization of tannase. Since the rhodanine-gallic acid complex forms only in basic conditions, after the completion of the enzymatic degradation of methyl gallate, KOH was added to the reaction mixture to ensure that the same pH value (pH 11) was achieved in all samples assayed. Determinations were done in triplicate. The optimal temperature for purified TanASg tannase was determined in the temperature range 4-65°C in 25 mM phosphate buffer (pH 6.5). For determination of the thermal stability of TanASg, the enzyme in 50 mM phosphate buffer pH 6.5 was preincubated in the absence of substrate at 22, 30, 37, 45, 55 and 65°C for 30 min and 2, 4, 6, and 18 h. Aliquots were withdrawn in triplicate at these incubation times to test the remaining activity under standard conditions. The residual tannase activity was determined at 37°C. The non-heated enzyme was considered as control (100%). The enzyme was pre-incubated in the presence of various metal salts and chemical agents using final concentrations of 1 mM. The effect of chemical inhibitors and stimulators on TanASg activity was investigated in triplicate by the rhodanine assay using methyl gallate as substrate. The additives analyzed were MgCl2, KCl, CaCl2, HgCl2, ZnCl2, Triton X-100, Urea, Tween 80, EDTA, DMSO, and β-mercaptoethanol. The extent of inhibition or activation of tannase activity was indicated as the percentage of the ratio of residual activity to complete enzyme activity in the control sample without addition of metal ions or chemical agents. Tannase activity measured in the absence of any additive was used as control (100%). The substrate specificity of TanASg was determined using 17 commercial phenolic esters (methyl gallate, ethyl gallate, propyl gallate, lauryl gallate, methyl benzoate, ethyl benzoate, methyl 4-hydroxybenzoate, ethyl 4-hydroxybenzoate, propyl 4-hydroxybenzoate, butyl 4-hydroxybenzoate, methyl vanillate, methyl 2, 4-dihydroxybenzoate, methyl gentisate, methyl salicylate, ethyl 3, 4-dihydroxybenzoate, ferulic methyl ester, and ferulic ethyl ester) as well as a natural tannins (epigallocatechin gallate, and tannic acid). As controls, phosphate buffer (50 mM, pH 7.0) containing thereagents but lacking the enzyme were incubated in the same conditions. The hydrolysis products were extracted twice with ethyl acetate (Lab-Scan, Ireland) and analyzed by HPLC-DAD. A Thermo (Thermo Electron Corporation, Waltham, Massachussetts, USA) chromatograph equipped with a P4000 SpectraSystem pump, and AS3000 autosampler, and a UV6000LP photodiode array detector were used. A gradient of solvent A (water/acetic acid, 98:2, v/v) and solvent B (water/acetonitrile/acetic acid, 78:20:2, v/v/v) was applied to a reversed-phase Nova-pack C18 (25°Cm × 4.0 mM i.d.) 4.6 μm particle size, cartridge at room temperature as follows: 0-55 min, 80% B linear, 1.1 mL/min; 55-57 min, 90% B linear, 1.2 mL/min; 57-70 min, 90% B isocratic, 1.2 mL/min; 70-80 min, 95% B linear, 1.2 mL/min; 80-90 min, 100% linear, 1.2 mL/min; 100-120 min, washing 1.0 mL/min, and reequilibration of the column under initial gradient conditions. Detection was performed by scanning from 220 to 380 nm. Samples were injected onto the cartridge after being filtered through a 0.45 μm PVDF filter. Two-tailed Student’s test performed using GraphPad InStat, version 3.0 (GraphPad Software, San Diego, CA) was used to determine the differences between means. The data are representative means of at least three independent experiments. NJ, IR and MET performed the experiments and drafted the manuscript. FLF, BR and RM participated in the design of the study and supervised the study. All authors revised and approved the final manuscript. This work was financially supported by grants AGL2011-22745, S2009/AGR-1469 (ALIBIRD) (Comunidad de Madrid), and RM2012-00004 (INIA). We acknowledge support of the publication fee by the CSIC Open Access Publication Support Initiative through its Unit of Information Resources for Research (URICI). We are grateful to J. M. Barcenilla and M. V. SantaMaría for their assistance. N. Jiménez is a recipient of a FPI fellowship from the MINECO and M. Esteban-Torres is a recipient of a JAE predoctoral fellowship from the CSIC.